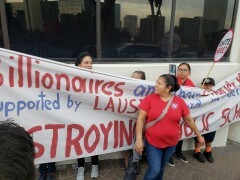 LAUSD Board approves cap on new charter schools | Fight Back! Los Angeles, CA - As of January 29, UTLA strike victories continue. 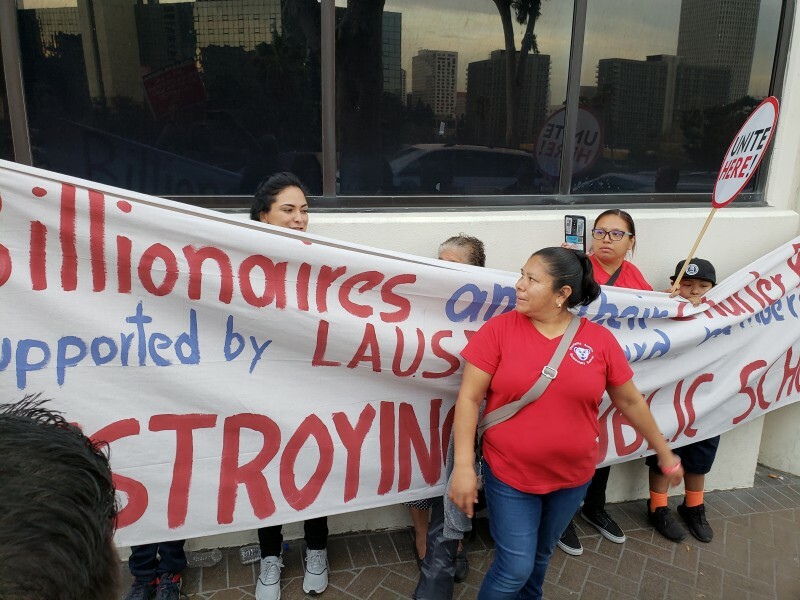 At a contentious public LAUSD meeting the Board voted 5-1 for a “moratorium on new charter schools.” A loud but small rally by the pro-charter forces chanted and gave misleading speeches promoting their lies. The LAUSD boardroom was packed, with many waiting outside and watching on remote TV. The pro-charter forces packed the room hoping to pressure the board members to vote against a resolution to cap new charter schools. To counter, Eastside Parents Against Privatization leader Eloisa Galindo and Julie Regalado spoke in support of a moratorium on charters. They also told of the damage and segregation charters school cause at LAUSD. This moratorium or cap on new charter schools was a victory won during the massive strike and rallies during the UTLA strike January 14 to 22. The strike saw over 30,000 teachers striking and over 300,000 students boycotting schools. The demands were: to improve LAUSD public schools, lower class sizes, community schools, more nurses, librarians and counselors, along with ethnic studies and decent wages. After round the clock negotiations at LA city hall, the pro-charter Superintendent Austin Beutner caved and included a moratorium of new charter school as part of the tentative agreement. The charter moratorium agreement does not try to eliminate the current large number of charter schools nor those that are in co-locations. However, the agreement does call for advance notices and for an effort to go to the California state government for changes and more future funding. LAUSD has been hit by a proliferation of charter schools which drain over $600 million per year in primarily Black and brown neighborhoods of Los Angeles. UTLA made holding charters schools back a central part of the demands and on second day of strike held a massive rally at the office of the CA Charter Schools Association. Centro CSO in Boyle Heights wholeheartedly participated in the UTLA strike by walking the picket lines every day at Breed Street School. CSO joined all the rallies and worked closely with Eastside Parents Against Privatization. The parent group and Centro CSO are part of the fight against the mega KIPP Promesa charter school project to build a large 625-student school in the heart of Boyle Heights at the old Lincoln Hospital. With the Boyle Heights Neighborhood Association, a lawsuit was filed on January 4 against the city of Los Angeles and KIPP Promesa charter school. February and March will see the court and community battle to stop this mega KIPP school. Please donate to pay for legal fees of the lawsuit http://gofundme.com/HelpCentroCSO and participate in CSO’s upcoming meeting February 20 at 6 p.m. at the Boyle Heights Benjamin Franklin Library. For more information call 323-943-2030.